Inspired by the wonderful sunsets we have both in this country and around the world I thought it would be fun to paint some seascapes with a theme. The colorful paintings I came up with for this collection are now on display as an Art In Wax Exhibition. 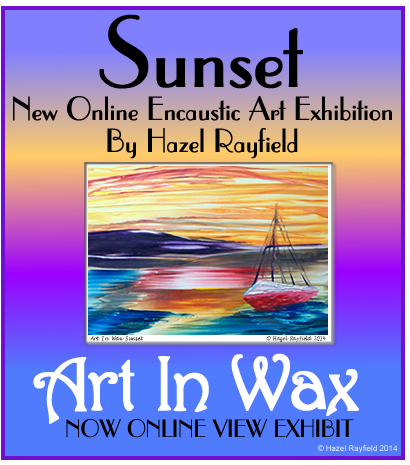 The collection of six pictures, all seascape style paintings are now online and can be viewed here : Sunset Art Exhibit 2014. This is a new exhibit of six hot wax paintings for 2014, they are in various sizes; two larger pieces @ 16 x 11, two @ 11 x 9 and two @ 8 x 6. I had great fun with colour and let my imagination run and flow with the wax ……. I hope you enjoy this new series of pictures, the pictures are for sale as will be some smaller versions. if you would like to purchase one of these pictures or commission a similar piece please contact me for more information. I have just finished these two scenic paintings so thought I would show them in a new blog post today, to start off the month …….. I have been painting lots of new pictures recently at A4 size which these also are. 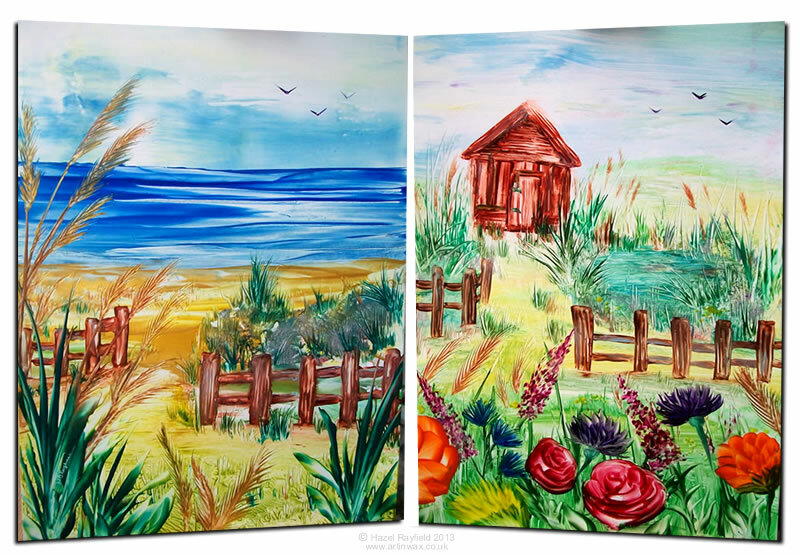 I am always looking for the next challenge and idea for a picture, and with the weather being so nice we have been out for walks along the coast and country side and I have been inspired to paint these two pictures, which are both styled as a rustic seascape and landscape, with over grown and wild flowers and grasses forming part of the mix of colours. My paintings have a impressionistic style I feel, which allows me when I look at a subject and interpret it with my own imagination and create the picture I want. I have had some great feedback on my paintings, especially when someone gets to own or see a piece close up, that they are amazed at the detail in the pictures and that they are created in wax. Do you own a piece of Art In Wax ……. why not leave me a comment ? When I first starting showing and selling my artwork online it was in the form of greetings cards created using my original paintings, not prints. As the cards were an aperture card they looked similar to being a mounted picture and I know of at least one person who has framed one of these cards using the card as the mount. If using glass in the frame, I would note that this is not what I recommend. It is important, as with many types of medium that the artwork is mounted so as not to touch the glass, as this may damage the painting. I rarely make cards to sell nowadays as my encaustic paintings are sold either mounted in Acid free Conservation board with a White core or hard backed onto mount board so they have a good structure and can be either mounted and framed or displayed in a free standing manner. I do however make cards on occasional, for my own use to give to friends and family or by commission if especially asked. I have been experimenting with mixed media artwork again, and came up with this little boat painting, just 3.75 x 2.5 inches in size, very slightly larger than an ACEO or ATC. 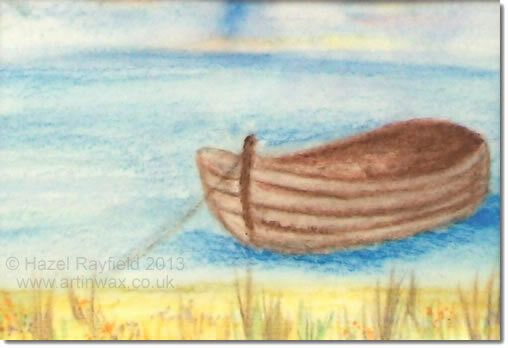 This boat picture is a drawing / painting created using watercolour pencils that, once the painting was dry I covered in several layers of clear wax. The picture has a softness to it I feel, the watercolour paper absorbs some of the wax, and as the mediums, watercolour and wax combine this effect was created. I am really pleased with the outcome of this combination. When lightly polished, as I do with all my encaustic paintings, the picture comes even more to life with the sheen and slight texture from the wax coating. As I am discovering there are lots of ways to use Wax and I love experimenting to see how things work and will be blogging about all the things I am trying out as Art In Wax ! 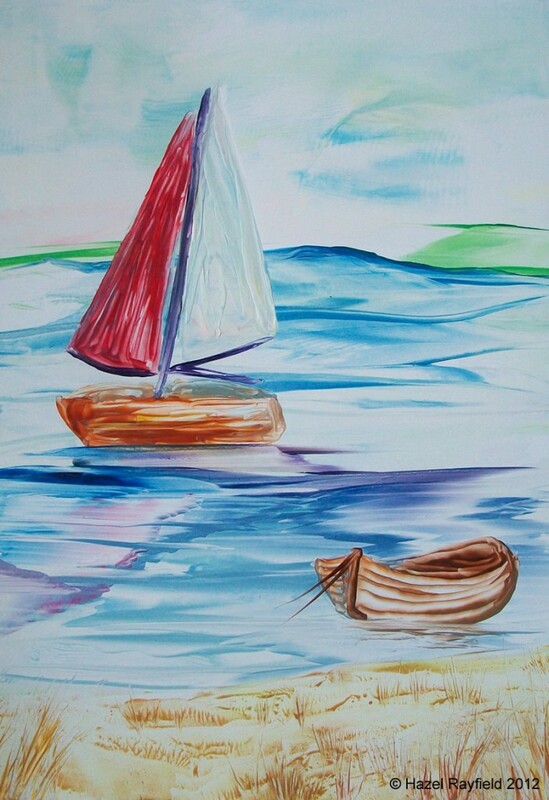 The photography below shows the mixed media boat painting as it is in the card, also pictured is an Encaustic hot wax, just wax this time, version of this boat scene.